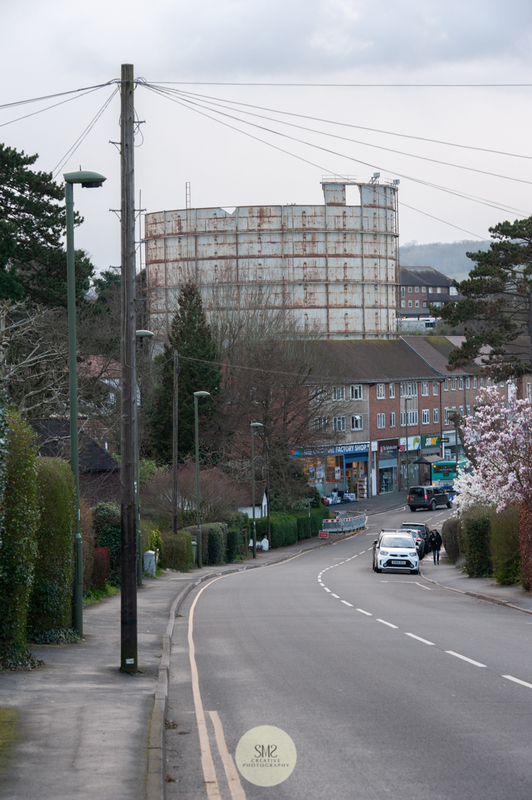 SMS Creative Photography Blog Base Oxted Gasholder April 2019 - Going, Going, Gone! 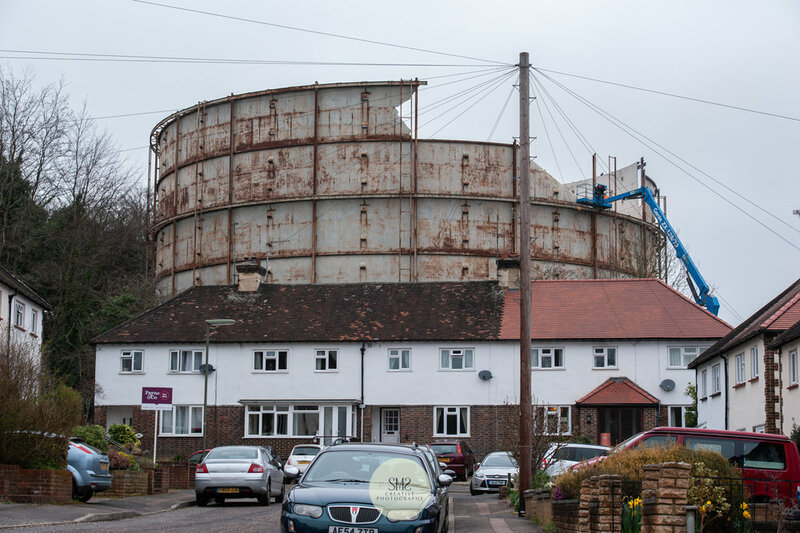 Oxted Gasholder April 2019 - Going, Going, Gone! 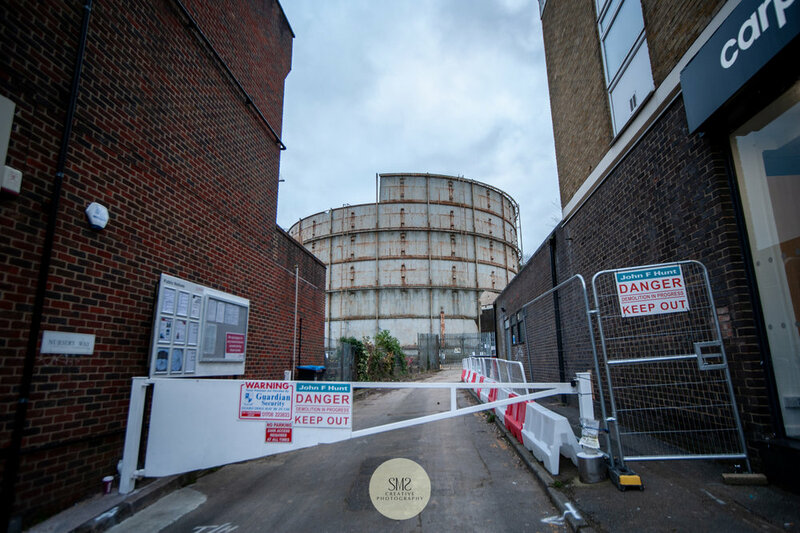 Welcome to my fourth blog about the demolition of the gas holder that I’m photographing for posterity and to satisfy my own curiosity. Since I last wrote on 15th March a lot has happened at the demolition site and the gas holder, as you can see has gone for good! As expected, once the roof was dismantled early last month as described in my previous blog, the next stage to remove the surround of 9 rings high took less time as a cherry picker was used with an operative working to cut away until it was at a manageable height for the next stage to take place. 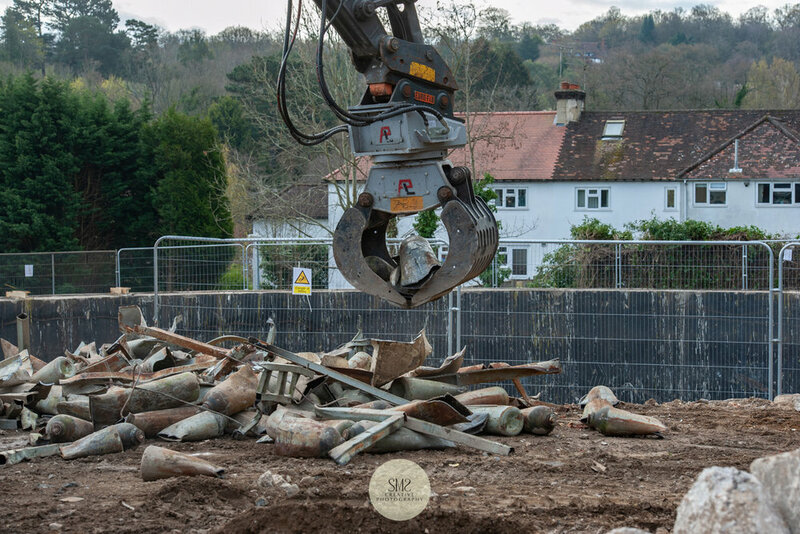 The final rings of the structure came down very fast indeed with the help of a very experienced operator who, with much precision controlled a cutting machine, which resembled a pre-historic creature that chomped its way through the steel, in what appeared to be an effortless operation. We experienced much rumbling here at the studio which sent me running with my cameras in hand to capture some of the final stages which happened within 3 days at the end of March. 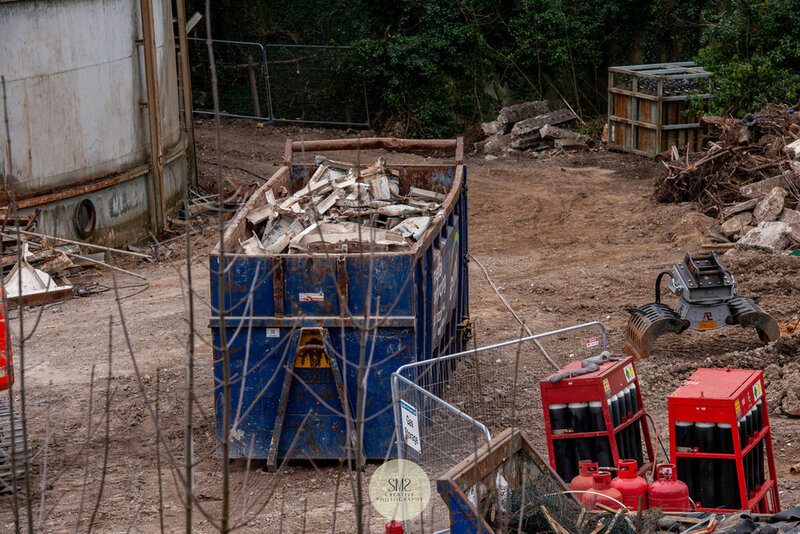 I’m going to leave the photographs to do the talking as they show the final stages of the demolition process. It really was a matter of going, going, gone and for good! The below sequence is from the top of Snatts Hill. Ring by ring it's coming down! Sad to see it go? Gone! You can see the train station platform in the distance. 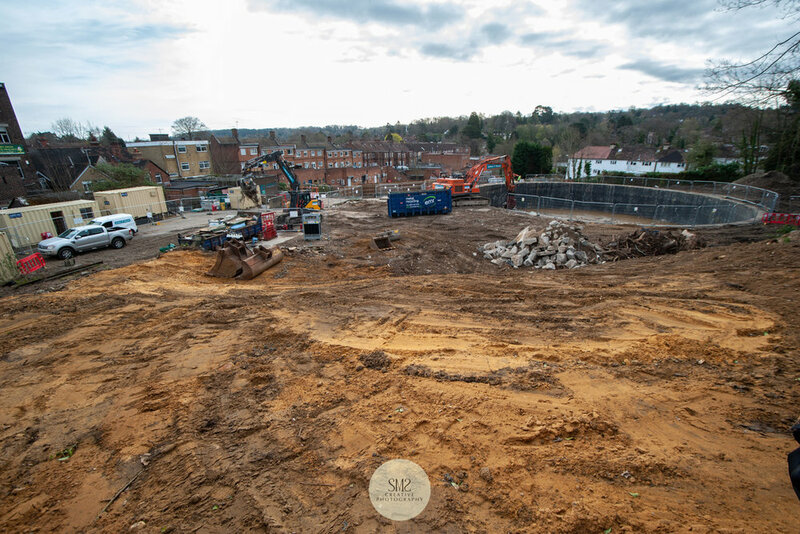 Now that the demolition process is nearing completion, next month in May, St William, the contractors will take their positions on-site to put in place the start of the building process for 111 luxury - 1, 2 and 3 bedroom apartments and penthouses. 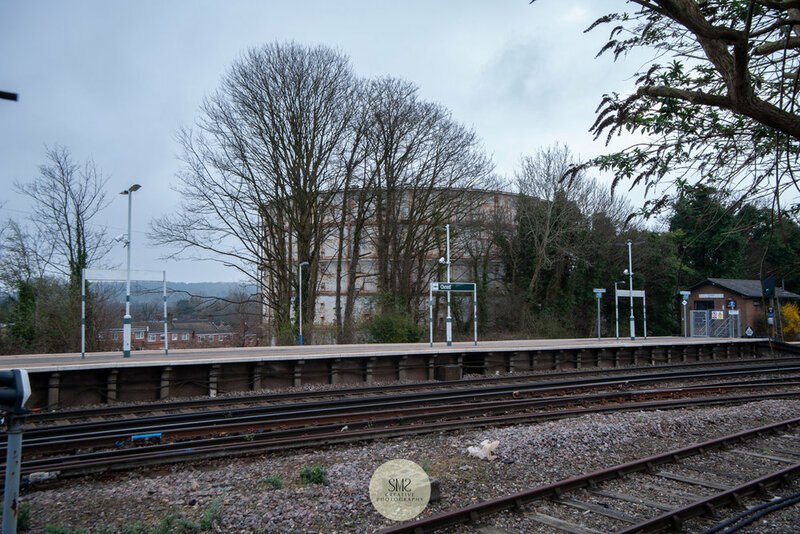 You can see a very impressive model of the housing development at Robert Leech Estate Agents opposite the studio, it really is worth taking a look if you are keen to buy one or are just curious to know more. The below sequence looking from a window at Priory House Dental Practice. The first incision splits the circle. The first piece disappeared in no time. Cutting the vertical posts releases the sides. Within a few seconds if was down. I didn't want to miss a second of this moment. Cutting each vertical post allows more movement. It crumbled like a piece of, well I suppose steel, it was very graceful. From Station Road East, between Carpet Right and Gloss. Ring by ring it was coming down. It's been here so long what will it look like when it's gone. 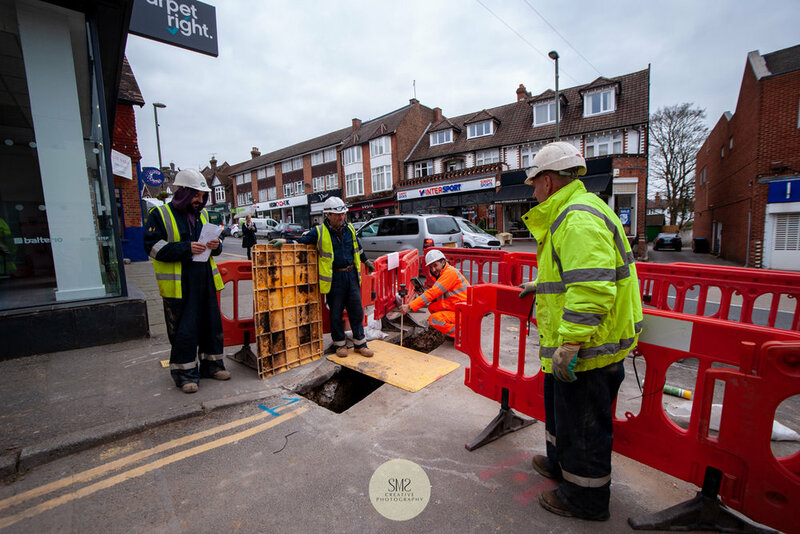 Workmen arrive to put the foundations in for the utilities. How come we are noticing it so much more now that it's going? This cutter resembles a pre-historic creature, don't you agree? When the first pieces of steel are dropped in here it sounds like they are falling into a bottomless pit as the sound vibrates around the site. Two machines work in unison cutting and picking up the pieces for recycling. Filled and ready to go including gas canisters that have been on-site for decades. The site is vast, I felt privileged to be given access to capture images like this one. The pieces of steel that fell in the pit are almost cleared. An operative in a cherry picker is used to cut away the sides. From Ellice Road car park. I use to park my car here at the foot of the gas holder. Taken on 27 March 2019. 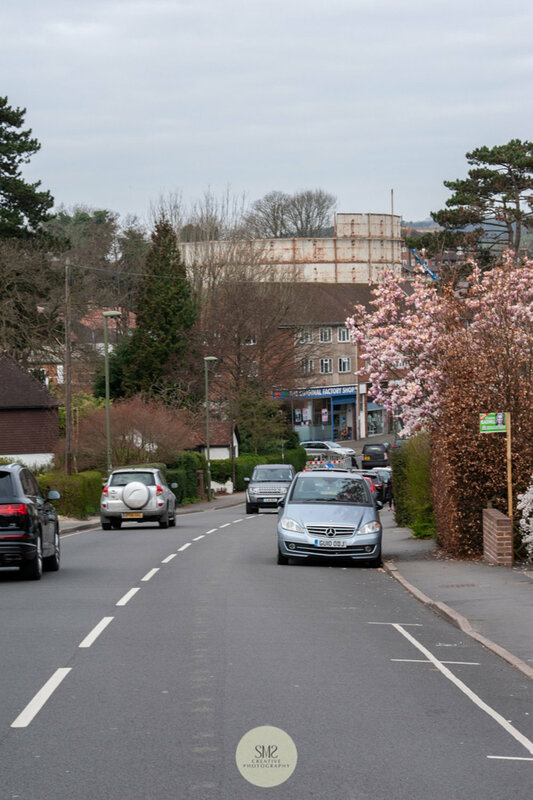 Photographed on 11th April 2019. It really has been a captivating and mesmerising experience photographing the process so far from various viewpoints. The photographs I have shared are just a small selection from a greater number that I intend to share at a later date. 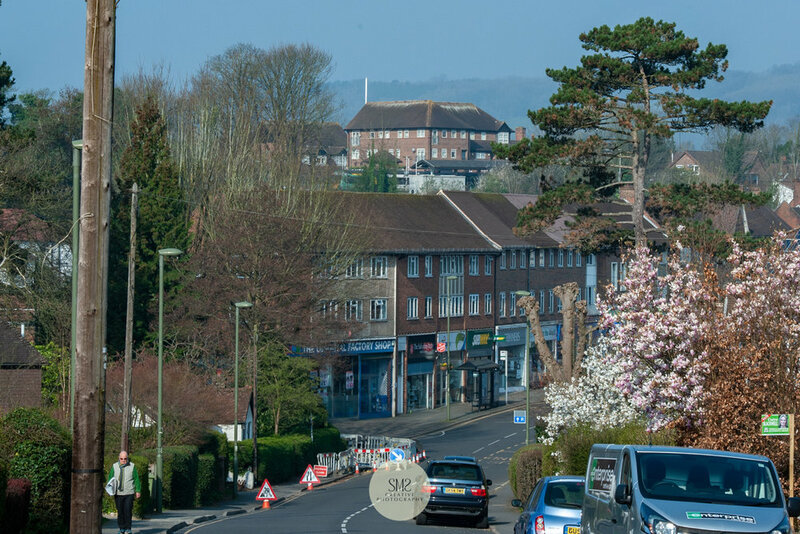 I am going to be continuing the story over the next two years during construction and the completion of Courtyard Gardens, a wonderful new addition to our unique town - Oxted. I hope this glimpse has taken you on an insightful historical journey. If you would like to subscribe to my monthly round-up newsletters where these blogs will feature, please scroll down to the bottom of the page to add your contact details on the ‘Subscribe to Our Newsletter’ button. If you missed the previous 3 newsletters you can see them here on the blog page of the website. In the meantime enjoy the weekend and I’ll be back next month with the next instalment.